I don’t know how else to express the amount of excitement this season of Game of Thrones has brought to the table. Each episode has been on point, with huge story plots connecting – finally! Sansa has had it going on this season, from escaping Winterfell and Ramsay, to being found by Brienne, to finally, FINALLY, reuniting with Jon Snow at the Night’s Watch. Wow, what a powerful scene, what a beautiful moment for two of our favorite characters. But here’s the thing, that wasn’t even the best part of the episode. If you’re an uber Khaleesi fan like myself, the last few minutes of the episode were magical. Go watch the episode, and when you’re finished listen to our recap podcast below. Let us know what you think, and also why was the episode titled ‘Book of the Stranger’? So I don’t want to be the source of all spoilers, but come on guys. It’s episode 8 of the fourth season you should be watching these episodes ON THE IMMEDIATE. Every second counts until the end. In a typical Game of Thrones jaw dropping ending, the Prince of Dorne aka The Red Viper aka Prince Oberyn lost the battle against Ser Gregor “The Mountain” in a grueling battle that determined the fate of Tyrion Lannister. At first everyone’s thinking the same thing, how can this little Prince of Dorne fight the huge and covered in armour Ser Gregor Clegane? Well, surprisingly, Oberyn was more confident, he was fast and doing twirls around The Mountain. 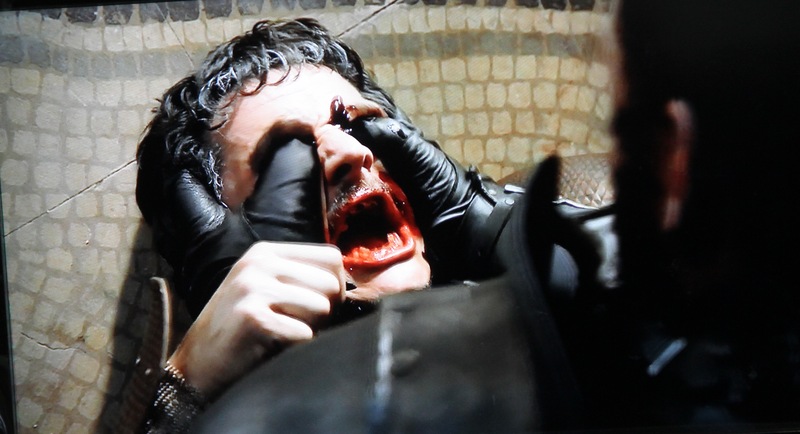 For the most part of the fight it looked like Oberyn was about to win. He even shoved his spear right through Gregor’s belly, but Oberyn let his guard down too quickly…and this happened. Now the big question is, what will happen to Tyrion? Is this the end of the road for him? I feel like this can’t be the end but with Game of Thrones you just never know- we’ll have to wait and see. For now, let’s take it to the polls! Game of Thrones: Season 4 Awaits! Guys can you believe this? Only a week left until the season 4 premiere of HBO’s Game of Thrones! I feel like just yesterday our countdown read ‘4 months to go’ and now the time has finally arrived. I think this is the most anticipated season of Game of Thrones. With last season’s Red Wedding episode they got way more attention than HBO ever dreamed of…and next Sunday will definitely make ratings history. Here’s yet another trailer for the fourth season. Keep an eye on the Game of Thrones YouTube page in the coming week, they’ve been uploading special behind-the-scenes videos and interviews…I feel like we’re going to the Superbowl but with dragons. LOL is someone trying to give us an anxiety attack? Last Sunday HBO released a 14-minute video that shares some insight on the upcoming fourth season of their ground breaking series- Game of Thrones. The trailers are usually 1-3 minutes, this one is surprisingly long and features interviews from the cast on their predictions for the new season. As someone whose read the fourth book (A Feast for Crows) I can assure you it’s going to be a crazy start (they held off on some crazy moments from the third book). I love the anticipation leading up to the season premieres, let’s soak it all up before we know we’ll be talking about the season finale! Here are the two trailers. The fourth season of Game of Thrones premieres April 6th 2014.